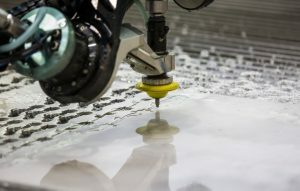 Industrial waterjet cutting is an extremely versatile manufacturing technique, useful in a wide variety of industries, and Hydro-Lazer is proud to be part of that legacy. One particularly noteworthy field of waterjet machining is the aerospace industry, a field which has exacting demands for the quality and precision of its parts. The range of materials and parts that are produced with the help of waterjet cutting is quite extensive: aircraft engine and body parts, military solutions like missile components, and even parts essential to space vehicles. Waterjet cutting and machining has been a key part of the aerospace industries for almost half a century, due in no small part to how accurate it is. Short of a laser, there’s not much that is more precise than a waterjet cutter, and nothing as clean. What kinds of materials are worked by waterjet cutting for aerospace purposes? Just about anything you could imagine: Aluminum, glass, foam, plastic, rubber, copper, carbon fiber and even titanium and metal alloys. On top of its cutting abilities, waterjet machining is environmentally friendly, producing no hazardous gasses or debris, and allowing raw materials to be preserved and reused. Hydro-Lazer has been part of aerospace engineering and manufacturing with its waterjet machining, and if you find that you have need of waterjet aerospace, we are happy to help. Please contact us for quotes, or for any information on our capabilities and what we can offer you.